Our friends at Purple Lab have yet another fantastic opportunity for those of you who love beauty AND fashion! 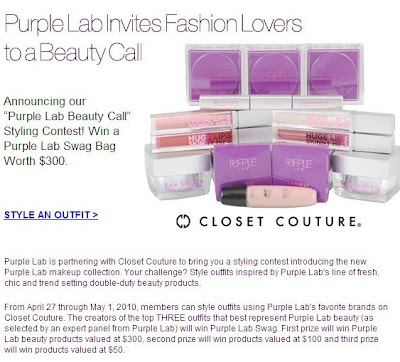 Enter the Purple Lab Beauty Call Styling Contest on Closet Couture and you could win a Purple Swag Bag worth $300! All you have to do is head over to Closet Couture, register and style outfits using Purple Lab's favorite brands.